Exclusive: A Preview of Surf’s Up ! In the last few weeks, Sony Pictures has been giving select journalists and theatre exhibitors a sneak peek at their summer animated movie Surf’s Up, the second feature film to be produced by Sony Pictures Animation. It’s being dubbed the “Spinal Tap of animated movies” due to the documentary style used to introduce and embellish the characters, most of whom are surfing penguins. ComingSoon.net had a chance to watch this presentation at special luaus thrown by Sony in Los Angeles and at ShoWest in Vegas, as well as talk to the principal cast and crew. The footage being shown by Sony includes the first ten minutes of the movie, which starts exactly like the current trailer with the voice of Shia LaBeouf’s Cody Maverick explaining the history of penguin surfing and the legend of “Big Z” and what he did for the sport before mysteriously vanishing. We then meet Cody and his family through a series of interviews from their Antarctica abode of “Shiverpool.” With a bully as a brother and an unsupportive mother, Cody really wants to get out of there, and he’s given his chance to escape when big-time surfing promoter Reggie Belafonte (voiced by James Wood) sends his sandpiper scout Mikey Abromowitz (Mario Cantone) to Shiverpool to look for new talent for a surfing competition on Pen Gu Island. Of course, Cody is very excited but during his audition, there are no waves so he chokes. Undeterred, he chases after Mikey’s whale transport riding on the waves created by its departure, begging and pleading until Mikey agrees to take him to Pen Gu Island. As they travel, Cody meets Chicken Joe, a surfing chicken from the MidWest voiced by Jon Heder who has a similar backstory. When we meet Chicken Joe, he’s enjoying the rush that comes with jumping into the water shooting out of the whale’s blowhole. On Pen Gu Island, we meet the rest of the cast including Lani (voiced by Zooey Deschanel), the island’s beautiful lifeguard and potential love interest for Cody, as well as his main rival, Pen Gu’s reigning surfing champ “Tank” Evans (voiced by Diedrich Bader). The memory of Big Z’s time on Pen Gu is still very present, but Tank has no respect for the legend, throwing rocks at Big Z’s board, which gets the cocky young upstart Cody riled and he challenges the champ to a surfing match, only to have a terrible wipeout. 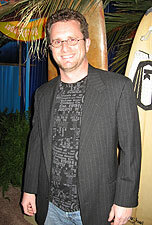 Lani takes him to the island medic known as The Geek, but as they spend time together, Cody realizes that this doctor is really the one and only “Big Z” himself. When he learns this, Cody begs the now out-of-shape former legend to train him and make him a better surfer. The surfing footage is impressive, looking as good as the footage from Dana Brown’s docs, and there are a lot of funny gags about the sport including a network called SPEN (Sports Penguin Entertainment Network). It definitely seems to be more in the Pixar vein of things where teens and older folks will be able to enjoy the humor and the action, as much as kids love the talking penguins and the physical humor. The inhabitants of Pen Gu will probably offer a lot of laughs like the cute toddler penguins that get up too all sorts of antics with one little guy who keeps pretending to drown in order to be rescued by Lani. In another scene, the Tank shows off his trophies to the documentary crew, explaining how he’s named all of them after women. It’s pretty funny but even moreso when his mother calls from off-camera embarrassing him. The quickly-edited montage of footage that followed the extended clips showed the characters in a lot of different situations, such as one scene of Cody running through a volcano’s lava, so one should expect that Surf’s Up will be a world-spanning adventure and not just one confined to Antarctica or Pen Gu Island. 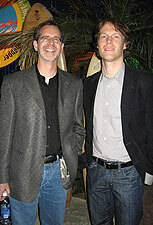 In Vegas, ComingSoon.net’s Edward Douglas talked with directors Chris Buck and Ash Brannon, as well as Surf’s Up producer Chris Jenkins. ComingSoon.net: Were you both already working at Sony Animation when this movie came along? Chris Buck: We came to Sony because of this project, and I think the main thing that attracted me was the documentary/reality TV style of this movie, where it’s not your standard animated movie. You really get to get inside the heads of our animated characters. They talk to the camera and do talking head interviews. It’s a very different movie. We’ve both worked on several animated movies, and this is something special. CS: What was your background before starting to work on this movie? Buck: I wasn’t at Pixar, I was just at Disney, so I was one of the directors on “Tarzan.” We both had animated for years. CS: Were you able to bring over any of your animators from Pixar or Disney to work on this? Brannon: A little bit of everything. It’s a small industry so people are rotating in and out of studios all the time. CS: Who came to you with the initial idea of the surfing penguins and to do it like a documentary? Brannon: The producer Chris Jenkins. When he pitched it, we were instantly in love with this idea, because you just don’t see it. I’d never seen anything like it before, and we got to take a lot of conventions in animation, just question them and say for example, “Is there a better way to record the actors? Should we record them one at a time one line at a time like you usually do or should we get them in a room together and improvise and have a little fun?” So that’s what we did, and we got incredible performances and a real natural acting. You really believe in these characters because a lot of it just came from the heart. Buck: After watching so many documentaries, we realized that our favorite moments in the documentaries or reality TV are the mistakes, the things that shouldn’t be on camera, so that’s what we embraced, even in the recording sessions. Goofs that the actors would have which we’d suddenly say, “That’s a real moment, we have to put that in.” That’s a nice little thing, so I think that the film is full of those kinds of moments that are pretty fresh. CS: Obviously Jeff Bridges seems like a given to play “Big Z” with his background as “The Dude.” How did you wind up with Shia and some of the rest of the cast voicing their roles? Brannon: All of them brought their own personalities to the characters. We asked them early on if they want to do improv and they’re like “Yeah, yeah, yeah” and the other thing we asked was “We don’t want you to do a cartoon voice, just do your own voice” and they all did. So they all brought pretty much who they are to the part. Shia brought a lot. He’s very funny but he’s very deep, and there’s a lot of stuff our character goes through. It’s a very emotional journey, so Shia brought a lot of great stuff to that. Brannon: Technically, the water was still the biggest challenge. For CG artists, making water, and especially breaking waves as we required for this movie, they’re like the holy grail of CG, but they pulled it off like gangbusters. 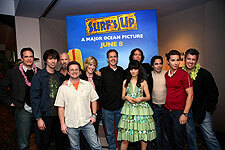 We’re able to take the audience on the surfboard and ride down the wave into the tube in this movie. Buck: We call it our board-cam. We actually have a camera on the front of the board that takes you down the waves. CS: Did you watch any of those great surfing docs that have been made over the years like “Step into Liquid” and “Riding Giants”? CS: Did you do any motion capture to recreate the surfing scenes? I won’t get technical, but we were able to shoot all of our scenes live with a hand-held camera. CS: I’m sure you’re both getting asked a lot about “Happy Feet” since you have another animated penguin movie coming so soon after them. Obviously, the difference is that in this they’re surfing rather than dancing. How do you feel about the comparisons that will be made? Brannon: Oh, it’s not a problem. We were doing this movie four years ago, and when we heard about the other movies, we said “Oh, that’s cool” and just kept moving because we’re really a different movie. although “March of the Penguins” is a documentary. I think we take it a little further than that. Our movie is very different than the others and I think there’s room for all of them. CS: Do you think kids will understand the documentary format? Buck: Absolutely. We’ve had some preview screenings, and kids get it sometimes better than the parents do. CS: Well, I guess there’s those nature documentaries we watched in school as a reference. Buck: And reality TV. Our kids have grown up with the “Survivors” and “American Idols” and all those shows, and to them, that’s just another form of entertainment to them, so it’s not anything strange. CS: Have either of you actually watched “Happy Feet” or did you try to stay away from it? Brannon: Well, we were pretty much done with our main body of work by the time they came out, but I have a new baby so I haven’t been to a movie in half a year. Buck: There’s a nod to it in our movie. Chris Jenkins: (laughs) I tell you what it was. We had a surfing penguin movie at Sony when I first arrived and that was four and a half years ago. It was going along the lines of “Romeo and Juliet” with surfing penguins and it was pretty bad. It just didn’t have anything different to it. Penguins were driving in cars. It was very very Saturday morning in a sense, so the idea went away. And I thought it was a very cool idea to exploit. I thought “surfing” and “surfers having interviews done on themselves.” I totally love “Spinal Tap” and all those kinds of movies and I thought, “Wouldn’t it be great if we could put a microphone up to an animated character and see what they have to say?” If you gave the actors deep back stories and treated it like they do in Chris Guest movies, what could we do with the medium? It was kind of born out of that. I wrote up a story about a little guy who lives very far away in a small town where he’s not appreciated following his dreams, ultimately meeting somebody he thought was long dead and the story kind of became a father and son story, particularly when Chris and Ash came on, the three of us melded and ended up writing the script together. CS: As far as this format, are the people doing the documentary also penguins or are they humans? I guess I’m wondering if this is a world like “Cars” or do we actually see any humans in this movie? Jenkins: It’s just penguins. We always thought that if you were ever going to wink to the audience and pretend “We’re having fun here now” you would be undermining yourself. It had to be like a reality TV show, like “Survivor” with penguins. Of course, what we discover is a deeper story along the way and the camera very voyeuristically goes deeper into the story with our two main characters and we uncover all this great stuff. you have penguins in “Madagascar” then you have “Happy Feet.” Obviously people love penguins, so what are they going to get out of this penguin movie that’s different? probably go back 50 to 60 years and it was all mice. We had rabbits. The thing is our story is different. It was designed for its own reasons to be a documentary, a mockumentary, and as it turns out, all the other penguin movies have really helped us. They sort of laid the path for us. They gave hints away at the reality of how penguins really live and we can have a really fun with it. CS: Will we see any of the realities of the penguin lifestyle as seen in “March of the Penguins,” only with them surfing instead of marching? Jenkins: There are elements of that definitely with things like the males having to sit on the eggs. You can have some fun with that, so there are elements that we took from the hard lives of penguins living in the Deep South to the hard lives of people living in Michigan, fusing them and seeing where the story would take us. You can view photos from both events here! 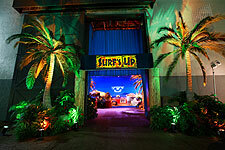 Surf’s Up opens nationwide on June 8. Heather Newgen’s jeans provided by Deener and sweater by Park Vogel.